First of all, my apologies for being silent last week. I was at home sick with the flu. 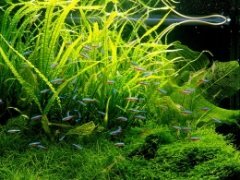 I missed an Aquascaping Answers post Wednesday, so all questions from last week will carry over to this week's post on Wednesday. With that out of the way, here's this week's aquascape. It's strikingly controlled and organized but it has a simple beauty to it. I love how everything has been kept low and close to the rocks, and how leaf size and texture has been used to bring out focal points. The natural "curve" the hardscape and plants create is also soothing. For more information, including specs and plants, check out the gallery. I've been looking for ideas for my 5ft. 'High' scapes look a bit odd, and hard to sustain over the whole length of the tank, but something like this would work wonderfully me thinks. Now, if only I had more light!